What happens when a visionary CEO is given a two hundred million dollar budget to re-design a company's space from the ground up? You get a sneak peek at the future of workplace. I had the pleasure of viewing the documentary Workplace, by Gary Hustwit, at Architecture & Design Film Festival in New York City. 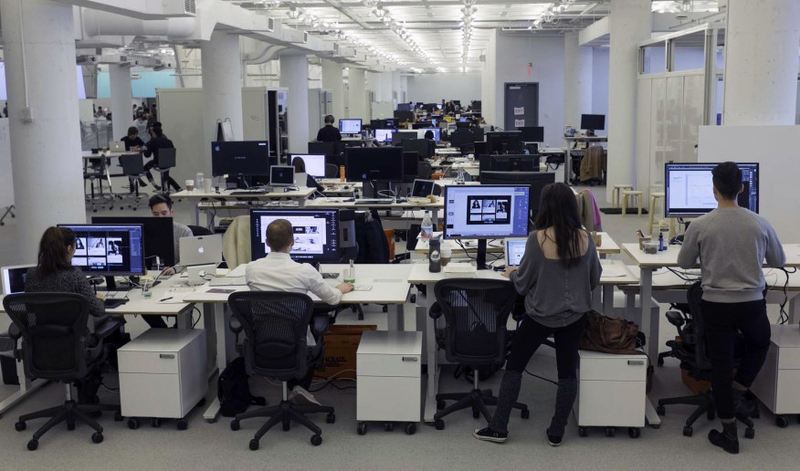 The story of Workplace follows R/GA, a cutting-edge digital agency in New York City. Prior to 2016, R/GA’s employees were scattered amongst four different buildings on a city block. The vision was to move from divided to unified: all employees under one space comprising 173,000 square feet. That's bigger than a football field! Bob Greenberg, founder of R/GA, had the opportunity to collaborate with architecture firm Foster + Partners to explore the possibilities of this office. They designed a way to facilitate a more harmonious environment for collaboration, team shifting, and flexibility so that an employee could choose an appropriate area to work according to their task at the given moment. Bob Greenberg, founder of R/GA peers at a model of his workplace future. You must mix up your work day with sitting AND standing! There is a core concept when it comes to designing a productive workplace, regardless whether it's a large corporation or a home office: empowerment to choose. By allowing individuals and groups to control their surroundings, we allow the space to come alive and become activated by people. 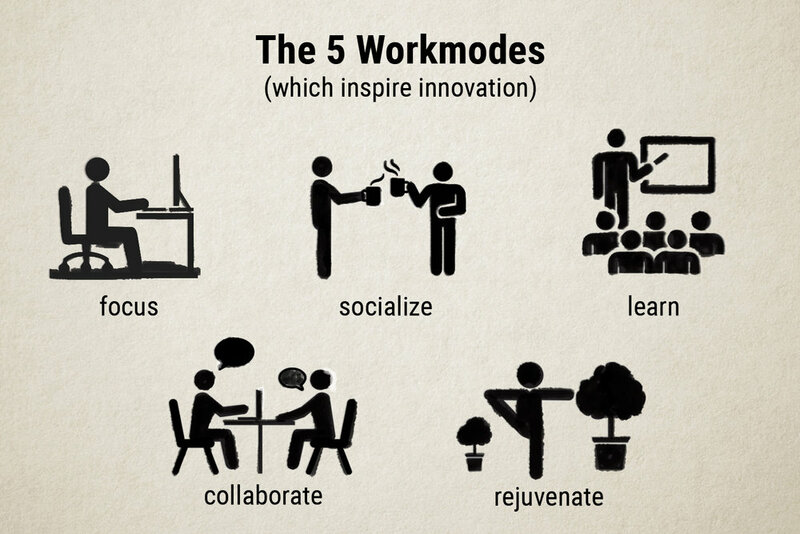 The 5 Workmodes: focus, socialize, learn, collaborate, and rejuvenate. Every space should be curated according to the culture while at the same time ensuring a free-flowing atmosphere with a variety of workmode options. Etsy Headquarters in Brooklyn emphasizes a tactile quality similar to the local artists they seek to promote. There are several rooms throughout the office adorned with work by local artisans. Because of these stylistic choices, employees feel connected to the Etsy mission while at the same time having the freedom to move about the office and pick the room they want to work in. The recent boom of co-working spaces has added more leaders in workplace design for example WeWork, Primary, and Croissant. There's now a multitude of freelancers, entrepreneurs, and students who could work at home all day long but are opting to go to a co-working space instead. And pay for it. Can the office be an invigorating place to be? Ask yourself: Do you need a silent space when you are on a deadline? Do you like a buzzier open office setting while performing more menial tasks? Everyone is unique and will have different needs. Find out what yours are. Get a laptop. Laptops = movability. If this is impossible, find ways to get work done away from devices. The art of jotting notes, drawing, or writing has been lost in the digital age. Bring a small plant to the office. A visual connection to nature has been shown to relax the mind and create a calm sense of focus. What other ways can increase the productivity of your workspace?